Majority of causes of childhood obesity start even before a child is born, in their mother’s womb. A pregnant mother’s diet, her pre-existing medical conditions and many genetic factors greatly contribute to causes of childhood obesity. Whether a mom chooses to breast- or bottle feed her baby is another important key element affecting childhood obesity statistics. 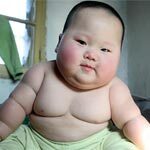 There’s a higher tendency in formula-fed babies to become overweight later in life compared to breast-fed infants. As children grow they get bombarded by junk food-inspired commercials that make it cool to eat greasy chicken fingers and sugar-laden breakfast cereals. As they later enter public school system, they face unhealthy food choices at school’s cafeterias that in no way promote good health and nutrition necessary to learn and grow. Not only junk food promotes dangerous diseases, it makes children jittery, overactive and unable to concentrate and learn due to high blood sugar fluctuations caused by consuming unhealthy treats. Let’s remind ourselves once again the main causes of childhood obesity, so we can try and address the factors that are still in our power to change. 1. Poor food choices offered at home due to parents’ busy work schedules. 2. Unhealthy lunch options being prevalent at majority of schools. 3. Lack of exercise and preference to sedentary activities like watching TV, computer and video games, online social networking. 4. Socioeconomic factor of childhood obesity must be considered as less economic advantageous people see fast food as the least expensive alternative to organic fruits and vegetables that could be taxing on their family budget. 5. Mass media promotion of junk food. 6. Genetics is a potential contributor to causes of childhood obesity but could be controlled with a proper diet and lifestyle. With child obesity statistics numbers becoming more staggering each year, parents need to raise their children’s awareness on how to make healthier meal choices. Every parent can make a difference by talking to their school’s principle or teachers and demand wholesome food choices offered at the school’s canteen. Eating dinners as a family will be a great stepping stone to start changing your family diet and connect with one another. Seeing a strong correlation between fast food and obesity in America is a key to recovery from the obesity plague. Easy workout routines can be incorporated in your everyday lives like going for family walks or bike rides instead of watching TV. Every parent and child should feel empowered to address the causes of childhood obesity.